dreadnaut: "A path that inches over the water between the two dual-ways, confusing Stunts to a point that Alan can dual-switch while staying on the same path." Well, it's not the same path but out of any path. Let me tell it this way: Imagine for a minute you are Neo and you are racing in the Matrix . You have to race the track watching the stunts elements not only what you see but what they really are. The elements are just squares in a 2D plane. I just left the road (the real path of squares, Neo!) after the dual-way begins and then re-entered where they crossed. The key is to reach the area in white border. There are more "white border areas" but in this track this was the best way. But here, this is not the case, as you never actually join one of the two paths. The car is just inside the first tile of the orange path -- what counts in such cases is the position of the centre point of the car -- and so both paths are used. Right on the limit! Ohh! Wow... now I see it! Dup! 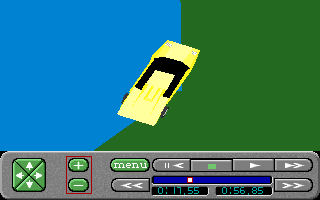 You programmed some years ago a tool to mark in a map where the car's position is in every moment of the replay. Could you show the first half of this replay in an image? So going over the water makes Stunts think that Alan is following the orange path, but that's the only orange tile he touches. After that, he drives through the non-track white tiles and back on the purple path, completing the dual-way switch. Beatiful!! I'm not sure what to conclude with this evidence.